A Vampire: The Eternal Struggle Blog — Facts, Thoughts and Musings about a Trading Card Game. 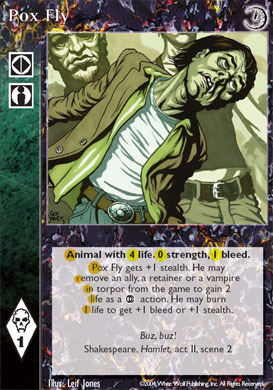 As part of the preview for the Gehenna expansion on April 1st, 2004 White Wolf showed the card “Pox Fly” on its website. Initially there was some irritation about the power of the card. But it was, of course, an April’s Fool joke by White Wolf corrected a few days later with an explanation. The card text was pure imagination and the artwork was later seen on Recalled to the Founder. The card was then shown without the markings (as seen on picture on the right), but a very observant reader could spot the date “4/01” and the word “April” beforehand. Being new to V:TES things like this are new to me, so thanks for posting it. Nice work by White Wolf for having a sense of humour. 2018-05-11 -- RTR 2018-05-11 clarifies some game terms, and designates Anarchs as a sect. 2018-05-05 -- Release of VTES expansion Lost Kindred. 2018-03-03 -- RTR 2018-03-03 changes some aspects of the influence phase, and Caitiffs are considered a clan. 2016-07-07 -- RTR 2016-07-07 allows proxy cards in VTES tournaments. A Vampire: The Eternal Struggle Blog -- Facts, Thoughts and Musings about a Trading Card Game.